What happens in an Open Appendectomy Procedure? Whether any of these incisions is superior to other incisions will not be determined medical literature; the ultimate determining component is your surgeon’s preference. 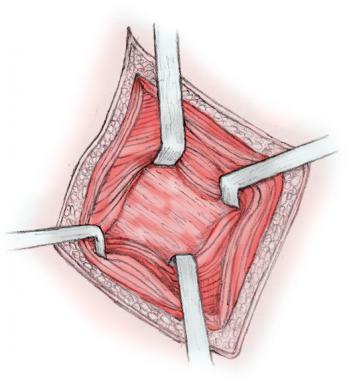 The technique illustrated below uses the McBurney-McArthur incision. Skin incision relies on McBurney point, which lies one-third of distance along the theoretical line between right iliac that is anterior superior (ASIS) and umbilicus. An incision is made at this point perpendicular to this line (McBurney-McArthur) or horizontally (Lanz). The incision extends 3-5 cm along epidermis creases. Make the incision with a No. 10 blade; use a Bovie electrocautery to incise through both the superficial (Camper) while the deep (Scarpa) fascia. Start appendectomy. Dissection through both superficial (Camper) and deep (Scarpa) fascia. The external or outer oblique aponeurosis is incised and exposed in the direction of fibers. Expose the oblique that is external, incising into the way of fibers, and split the outside oblique muscle bluntly with alternating Kelly clamps and Roux retractors. Open appendectomy. 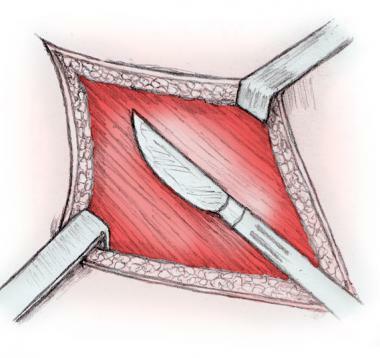 External oblique muscle tissue split bluntly by using alternating Kelly clamps and Roux retractors. This blunt muscle dispersed, along with appropriate retraction (again, the authors believe that the Roux retractor is the better), allows visualization of the transversalis fascia plus the peritoneum. Open appendectomy. A sequence of muscle splitting and retraction is continued with the fascia of both internal muscle tissue that is oblique transversus abdominis to expose transversalis fascia and peritoneum. 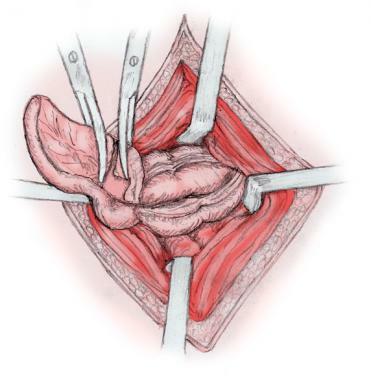 Perform the incision on peritoneum in a craniocaudal orientation with Metzenbaum scissors, thereby obtaining access to the peritoneal cavity. Once the cavity is opened, any fluid experienced should be sent for Gram culture and stain. 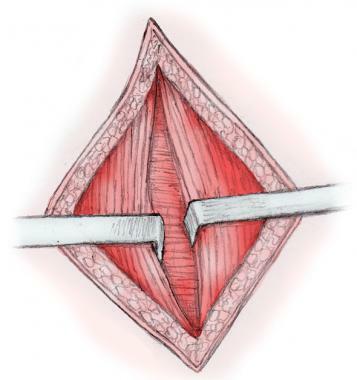 Transversalis fascia and peritoneum are grasped with two right clamps, with palpation between surgeon’s fingers, along with care taken up to avoid entrapment of any structures that are underlying. 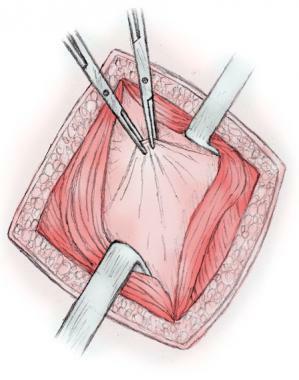 An incision is made with Metzenbaum scissors, and cavity that is peritoneal entered. The appendix is removed through either an antegrade or a retrograde technique. In conducting the antegrade approach, identify the ascending colon and its taeniae coli, and make use of a several Babcock medical clamps to hold them together until they convergence, pinpointing the base of the appendix. Free the appendix-mesoappendix complex from its adjacent, often inflamed, tissue, and deliver it into the injury. The mesoappendix, holding the appendiceal artery, is then ligated and separated from the appendix. Open appendectomy. In antegrade approach, the ascending colon and its taeniae coli base of the appendix. Appendix-mesoappendix complex is freed from its adjacent, often inflamed, tissue and delivered into the wound. Mesoappendix, carrying the appendiceal artery is ligated (3-0 Vicryl 2 times) and separated from the appendix. The appendix could be removed in several ways, including simple ligation ( the authors’ preference), purse-stringing, and inversion appendectomy. The actual method of resection does not seem to be a factor in regards to wound infection, length of hospital stay, postoperative fever, and abscess formation that is intra-abdominal. Start appendectomy. Completion of appendectomy by the division of appendix between 2 ligatures, closer to the cecum. The appendix is surrounded by inflammatory tissue, omentum, or both, making identification difficult. The base associated with the appendix is found first, exposed, ligated, and transected in the retrograde technique. Attention is then turned to the mesoappendix, that is ligated last. 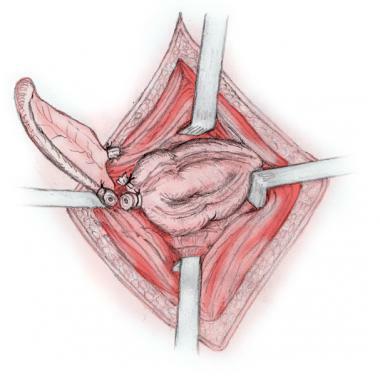 Once the appendectomy is completed and the wound is copiously irrigated with normal saline, grasp the peritoneum with two straight clamps and close it with a continuous 3-0 polyglactin stitch. Approximate all of the split muscle mass t, using 3-0 polyglactin at each level. Close the oblique that is external with a continuous 2-0 polyglactin stitch. Approximate the Scarpa fascia with 3-0 polyglactin, and 4-0 poliglecaprone subcuticular interrupted sutures for epidermis closure. The injury may be closed at the musculofascial level, left open and stuffed for 3-5 days, and shut secondarily if wound contamination is a concern in complicated appendicitis. Another option is to leave a Penrose drain in the wound and remove it 2-3 days later. If an abscess or phlegmon is discovered, the abdomen must be thoroughly irrigated with normal saline. Closed suction drainage might be properly used in these circumstances or if the adequacy of appendiceal stump closure is of concern. By a 2015 Cochrane review, it is unclear whether routine abdominal drainage is effective in preventing abscesses that are intraperitoneal open appendectomy for complicated appendicitis. The patient should be encouraged to ambulate, with appropriate pain control after completion of the medical procedure. The diet should be recommended based on the patient’s tolerance, with plans for release on postoperative day 1 for noncomplicated appendicitis time. Discharge instructions consist of pain management, instructions on indications for the urgent return to the emergency department, and a working office appointment in 1 week’s time. Same-day discharge protocols have been studied in pediatric clients appendectomy that is undergoing severe nonperforated appendicitis and seem to be safe and efficient with the appropriate patient selection. The postoperative outpatient office visit evaluates the patient’s continued recovery by having a step-by-step history and real examination, discussion of the last pathology, and assessment of the surgical wound. Resumption of normal activity does occur within one day after the procedure; sufficient analgesia permits safe return to responsibility that is daily. The mortality and morbidity of acute appendicitis (AA) are related to the stage of this infection at presentation, and both are notably higher in cases of perforation. The mortality figures for nonperforated and appendicitis that are perforated 0.8 and 5.1 per 1000 situations, respectively. The rate that is average of at presentation is 16-30%, but in elderly and young patients, it’s significantly increased because of delays in diagnosis. Common early complications linked with any surgical method include bleeding, surgical-site illness (SSI), intra-abdominal abscess, unrecognized enteric injury, and fistula formation. SSIs are determined by the known level of intraoperative injury contamination, with rates of infection which range from less than 5% in easy appendicitis to 20% in clients with perforation. In a meta-analysis of 54 randomized studies that are medical laparoscopic with an open appendectomy, SSIs were not as likely after laparoscopic appendectomy than after open appendectomy. Whatever surgical approach is chosen, preoperative intravenous (IV) antibiotics have demonstrated an ability to reduce the postoperative rate of SSI. In the postoperative period, fluctuating pyrexia, along with worsening diarrhea, may give evidence to the development of intra-abdominal or pelvic abscesses, specifically after gross contamination of the peritoneal cavity. The incidence of intra-abdominal abscesses is increased nearly threefold after laparoscopic appendectomy. The diagnosis can be verified in the form of either ultrasonography or tomography that is computed (CT); treatment consists of radiologic drainage and proceeded IV antibiotics. Other early complications primarily include an anterior wall surface that is abdominal damage, enteric leaks from unrecognized injuries, and postoperative ileus and fistula development. Late complications consist of an incisional hernia, stump appendicitis (recurrent infections from a retained appendiceal stump), and obstruction that is small-bowel. Small-bowel obstruction occurs in less than 1% of patients after appendectomy for uncomplicated appendicitis and in 3% of patients with perforated appendicitis who are monitored for three decades. About one half of these patients current with bowel obstruction during the year that is first. Complicated appendicitis includes gangrenous or appendicitis that is perforated the presence of an appendicular abscess or phlegmon. The blood that is white (WBC) count, the granulocyte count, and the C-reactive protein (CRP) level have the stronger discriminatory capacity for perforated appendicitis. High WBC and granulocyte counts and an increased CRP concentration are relatively strong predictors of perforated appendicitis, with a likelihood ratio because high as 7.20. These instances are typically managed conservatively by administering IV antibiotics and draining an evolving abscess if indicated; but, this approach, again, has been questioned within the literature that is medical. A caveat that is important to remember with this therapy algorithm is the lack of peritoneal signs. Due to the delay in diagnosis and treatment.The recovery time and the corresponding length of hospital stay are discovered to be dramatically longer with this particular approach than with appendectomy done at the time of presentation because of the delay in searching for diagnosis and treatment. An interval appendectomy in the presence of the fecalith that is identified the surgical approach that is currently in vogue. Patients aged 40 years and older may benefit from further investigations (e.g., colonoscopy) and close follow-up to rule the chance away from coexisting disease (e.g., carcinoma).